The dedicated LogicKeyboard simplifies and accelerates controlling Adobe Premiere Pro. 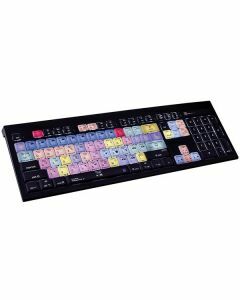 The shortcut based system is the perfect solution for post-production facilities, professional video editing houses and any other user who requires all the custom key commands to be readily accessible from a dedicated, clearly labelled, colour-coded keyboard. The LogicKeyboard can also be utilised as a learning aid for those looking to hasten their use of Adobe Premier Pro and familiarise themselves with the suite’s key commands. Additionally, since the Adobe Premiere Pro dedicated keyboard also includes all the regular letter, number, and symbol labelling found on a conventional keyboard, it’s a simple substitute. Easy to set up and use. No software required. Its soft touch keystroke makes it ideal for all day comfort. Only requiring two cables, one for the USB hub and one for the keyboard itself, the Astra series is perfect for editing systems that use USB KVM extenders, and installations necessitating data security. LogicKeyboard is one of the world’s leading keyboard innovators. They specialise in shortcut keyboards and keyboard cover solutions that are practical, elegant and designed for maximum efficiency. The LogicKeyboard is impeccably visualised and exceptionally user-friendly, it’s an ideal fit for professionals in video editing, visual effects and motion graphics. The LogicKeyboard is constructed using only the finest materials to craft simplified workflows, seamlessly integrating into a user’s environment for easy plug-and-play capability and world-class performance.